While decipherment of Linear A tablet HT 1 (Haghia Triada) appears at first sight beyond reach, this may not actually be the case. Of the 6 words on this tablet, only 3 are likely to be Mycenaean-derived, qera2u (qeraiu), kiro and kupa3nu (kupainu), while the other 3, zusu, didizake and aranare, are almost certainly Old Minoan, i.e. written in the original Minoan language. As I have pointed out over and over, a number of Linear A tablets appear to be inscribed in a combination of the Mycenaean-derived superstratum and of the Minoan substratum, as is almost surely the case here. But even if 3 of the words on this tablet are probably Mycenaean-derived, 2 of them, qera2u (qeraiu) and kupai3nu (kupainu) require further analysis. How can it be that qeraiu is derived from gerron (Greek Latinized) = “shield” and kupainu from kuparissinos (Greek Latinized) = “made of cypress word”, when the orthography of the Mycenaean-derived words diverges from the original Greek, especially in the case of kupainu, which does not exactly appear to resemble kuparissinos? But there is an explanation and it is this. The orthography of the Greek words must be adjusted to meet the dictates of Minoan spelling in each and every case in which Mycenaean-derived words are imported into the Minoan language. This phenomenon is analogous to the imposition of the Norman French superstratum on English pursuant to the Norman conquest of England in 1066 CE. The Mycenaean conquest of Knossos and Crete or, failing that, of their all but absolute suzerainty over these territories ca. 1500-1450 BCE appears to have had a similar outcome, namely, that much of the vocabulary of the source language of the invaders, the Mycenaeans, found its way into the target or original language, Minoan. But in so doing, the originally Mycenaean vocabulary would have had to be adjusted to standard Minoan orthography. and on and on ad nauseam. This phenomenon applies to every last substratum language upon which a superstratum from another language is imposed. So in the case of Old Minoan, it is inevitable that the orthography of any single superstratum Mycenaean derived word has to be adjusted to meet the exigencies of Minoan orthography. kiro, which if Latinized, is kilon, almost the exact equivalent of the Greek keilon. And kupa3nu (kupainu), Latinized = kupainu (kupaino) at least approximates the Greek kuparissinos, but with the the syllables rissi dropped. Compare this last entry with French-English similitude = similarity and you can see at once that orthographic metamorphoses even as divergent as these are possible. So chances are that kupainu may in fact be equivalent to kuparissinos, although there is no way to verify this with any certainty, except for one thing. Context. Since we know from line 1 that we are dealing with 192 shields and lances * (i.e. arrow shafts *), it is not too much of a stretch to conjecture that kupainu does correspond to the Greek kuparissinos, because we know from archaeological and historical evidence that Minoan and Mycenaean shields were of wicker work. And it is well within the realm of reason to suppose that such wicker shields were constructed of flexible, pliant cypress wood. Cypress wood is smooth grained and lightweight and has natural built in preservatives or oils that make cypress long lasting and resistant to water damage. It could be combined with bronze and leather on Mycenaean and ancient Greek warrior shields. And according to Wikipedia, The word cypress is derived from Old French cipres, which was imported from Latin cypressus, Latinized from the Greek κυπάρισσος (kuparissos). Ergo. However, we are still left with the puzzle, what do the Old Minoan words, zusu, didizake and aranare, mean? Once again, context comes to the rescue. It is entirely reasonable to suppose that a Linear A tablet dealing with cypress shields and lances would also cover other military paraphernalia essential to self-defence. The most obvious candidates are spears and swords, for zusu and aranare respectively, though in which order we cannot say for certain. The inclusion of swords as one of the alternatives is well justified, since pakana, i.e. swords, frequently appear on Linear B tablets. As for didikaze, I will not speculate, although it too more likely than not references military apparel, perhaps signifying armour. Aranare (knives?) is plural, singular = aranarai. Since the word is diminutive feminine, the decipherment “knives” clearly makes sense in context. Nevertheless, any decipherment of  zusu, didizake and aranare is by nature problematic. Assumptions are always dangerous, even in the case of a tablet such as this one, where context would appear to support such conclusions. But as I have so often repeated, appearances can be and often are deceptive. You see illustrated here in its actual size the Linear B tablet An1910_217_O at the Ashmolean Museum/British Museum. Like the others we have recently posted, this tablet is concerned with a tailor adding the finishing touches to cloth, more specifically the linen undertunic Mycenaean warriors wore under their breastplates, known as toraka in Mycenaean Linear B or thoraxes in ancient Greek. The first word on the first line after the left-truncated PA is the name of the tailor, Apasakiyo in Linear B. The Greek below the Linear B Latinized text is the translation of the original Linear B text on this tablet. This is followed by the literal & free English translations, with the caveat that I am unable to translate the double syllabogram WE WE following the supersyllabogram QE inside the ideogram for a shield, meaning that the shield is a wicker shield. This is perhaps one of the easiest supersyllabograms I have ever had to translate. It is pretty much self-evident. The supersyllabogram RI stands for “rino” which is the Linear B word for “linen”, referring to the linen undergarment or linen tunic or linen chiton. Mycenaean armour consisted of an outer plated armour called “toraka” in Linear B or “thorax”, which means “breastplate armour” in English. Under the breastplate the Mycenaean warriors wore an undertunic, a.k.a. chiton, which was made of linen. The only question is, why is the supersyllabogram attributive, appearing as it does inside the ideogram for “tunic”? Attributive supersyllabograms always describe an attribute of the ideogram within which they fall. The ideogram is of course that for “tunic”. But it is more than just a tunic. It is a linen tunic. Hence, “rino” or linen is attributive. The Linear B and ancient Greek for “thorax” appear just below the Linear B, Linear B Latinized, ancient Greek and English for “linen”. 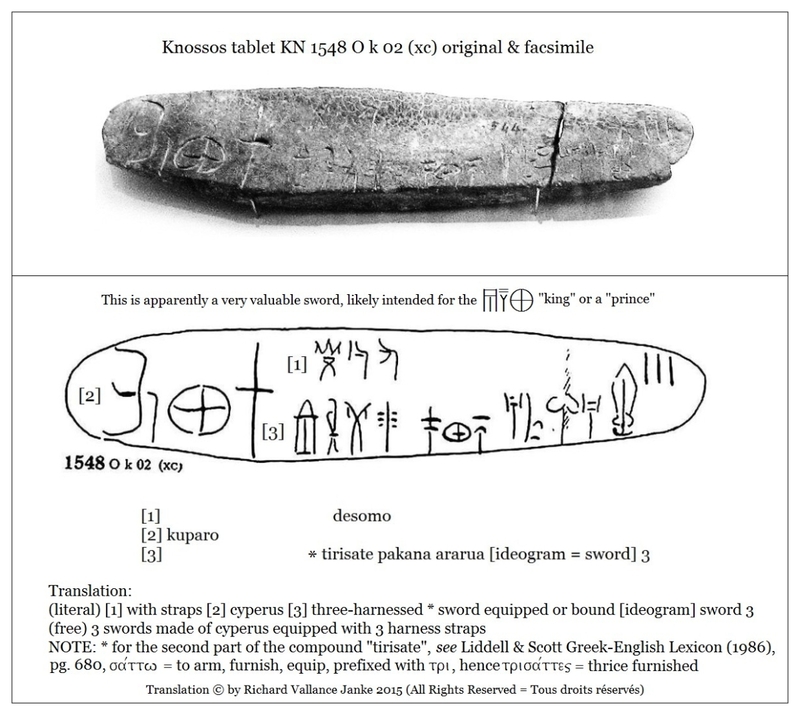 This is one of only two tablets in the entire corpus of Linear B tablets which has two supersyllabograms modifying their ideogram, making them a unique phenomenon. The other one appears in the next post. While the supersyllabogram ZE, meaning “a team of horses”, is straightforward, RO appears only once on this fragment, and nowhere else on any Linear B tablet or fragment, regardless of provenance. L.R. Palmer, in “The Interpretation of Mycenaean Greek Texts” (1963) defines it as meaning “a part of the horse trappings, made of leather”. I have no reason to discount this interpretation. It is unusual for the ideogram for armour to follow that for horse, and especially for the scribe to indicate that there are two (2) sets of armour for the (chariot) drivers, one for each... unusual because the ideogram for armour almost always follows that for chariot and precedes that for a team of horses. Be it as it may, that is the way the scribe inscribed it; so we'll take it at its face value. These two tablets were perhaps the easiest I have had to translate. No further comments are necessary. Since there is so little text on these tablets, I did not bother translating the Linear B into archaic Greek. The fragment (left) and apparently intact tablet (right) at Knossos from Scripta Minoa are approximately actual size. We can easily see that the striations, ridges, pockmarks, wear and tear, inter alia, make it difficult to read the originals. Notice how tiny they are. The facsimiles are, however, very easy to read. The fragment (left) and apparently intact tablet (right) both have the supersyllabogram MO, otherwise known as an adjunct, meaning “single” or “one” . I shall be posting more fragments and tablets illustrating the supersyllabogram ZE, meaning  “a pair of” or “a team of” in the next two posts. While the text of this fascinating tablet is largely straightforward, the word “tirisate” at first posed problems for me. But even at first glance, I could see that “tirisate” had the prefix “tiri”, which almost certainly means “three”, and I quickly deduced that the second part of the word, “sate” was a verbal form. Consulting Liddell & Scotts' Greek-English Lexicon (1986), I was rewarded with the translation you see for this word, which I take indeed to be the present participle of the verb, “to arm, furnish, equip”. Hence the translation. This is not the first time I have encountered compound lexemes in Mycenaean Greek, which were rendered into separate components (words) in later ancient dialects in the Greek alphabet. NOTE: we have now exceeded 900 posts on our blog!